I know… My posts are like buses, none for ages then several at once. I promise though, I’ve been working hard and doing some interesting things. One very interesting project I’ve been working on is with the Knitting and Crochet Guilds archives near Holmfirth (check out “last of the Summer wine to see how beautiful this place is). The archives are a huge collection of knitted and crocheted items, books, needles, hooks, yarn, patterns… If it’s yarn related it’s probably found here and I was totally in heaven. Way back in August I was at the ‘In the loop’ conference in Glasgow and heard a talk by Barbara Burnam about miser purses, then in November I wrote a blog post called ‘Thinking the future through the past’ It talked about Miser purses and how I saw a future in the simple design of the purses. I’d been carrying around the Crochet Traditions 2011 edition (available from Interweave) fr many years. It had an article by Gwen Blakley Kinsler about the miser purse and a pattern t make your own. It was one of those patterns we keep in the hope that one day, we’ll get around to it. For years, that pattern and article had been my only link to a miser purse and it’s history. The In the loop conference allowed me to see a miser purse up close, although in a sealed box and as it was passed around the room I felt it was more a glance than a good look. It was a few weeks ago, while at the KAC archives that I came across a small box labelled netted purses. Inside the box were 3 small netted miser purses. Here, at last, was my chance to look up close to a miser purse. Through the sorting at the archives I’ve since found other boxes with old handmade purses and also come across another great purse idea, the pence jug. These tiny purses look like flat jugs with a ring on the handle, pennies were put inside the jug and the ring pulled over the top of the ‘jug’ securing the opening. My response to the archives has been to make some purses inspired by what I’ve found. The purses from the archives and my own inspirations from them will be on display in a small exhibition in the Quayside building at Huddersfield University starting the 11th April. But for those who can’t be there, here’s a sneak preview of my own attempt at a pence jug. I didn’t write down the pattern, although I could do. I used a 1.60mm hook and size 20 cotton. Made a double crochet base (single crochet – USA) then beaded the edge. The top is a crochet fan and back post triple crochet, double crochet handle with a beaded ring. Finally I made a tassel for the base. 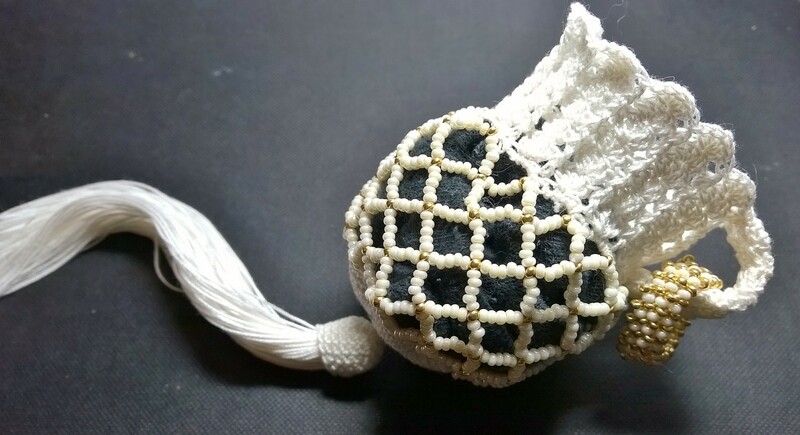 I love your little white beaded purse, and it seems to me that the level of skill involved is just as much as in the Victorian originals. I assume the ring fits over the neck to close it? It does, I’ve made a knitted miser purse too and if I have time, which isn’t looking likely I want to make a chain maille purse as well. It was the Huddersfield guilds Irish crochet night that reminded me how much I liked working in fine threads. A really interesting blog post as always. Love your creation too. Lush! I love your beaded one! Looks fit for royalty!